From fighting cows in Valais to Hornussen (golf crossed with baseball), not to mention an International Film Festival (Locarno) and hot jazz on the shores of Lac Leman, the Swiss have a surprising partiality to partying and leisure events! 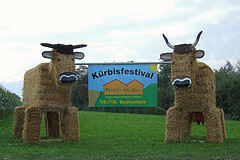 And of course, being Swiss and therefore efficient and fanatical about details, they have produced an exhaustive list of what must be every festival, exhibition, sports event and local baking competition in Switzerland, and you can search it in a whole load of ways on the Swiss tourist website. Most major Swiss cities have their own symphony orchestra, opera or theatre, and a lot of smaller towns and villages have chamber groups or quartets. Classical music events in Lucerne and Gstaad are important fixtures in the European musical calendar. Not just classical music, either: jazz enthusiasts will already be aware of the Bern, Willisau and Montreux Jazz Festivals.